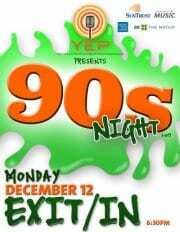 Tonight (12/12) the Young Entertainment Professionals Network invites Nashville to take a break from holiday parties and join them for 90’s Night. The concert at Exit/In will kick off at 6:30 p.m. with hit cover songs from the 90’s most popular artists. Tickets can be purchased here in advance. The event is a benefit for the Be The Match Bone Marrow Registry. The Young Entertainment Professionals (YEP) Network is an organization for up and comers in the entertainment industry, which plans mixers, showcases and educational events throughout the year. 90‘s Night performers include Thomas Rhett, Charlie Worsham, Jessica Cayne, Brinn Black, Ward Guenther, Lindsay Brandt, Josh Grider, Morgan Myles, Brinley Addington, Shea Raye, Kelly Paige, Landon Austin, Joshua Eric Wright, Melany Watson, Robert Kelly, Chase Foster, Joey Hyde and Brent Cobb.